Of all the different sample slabs that have been produced, I have always found the circulated coin samples to be the most fascinating. Maybe it’s because, in most cases, this type of sample can have more than one date and the challenge would be to find all the dates produced. 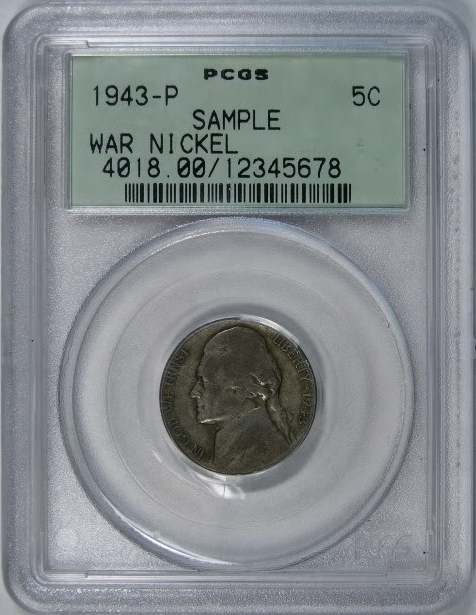 Such is the cases with the War Nickel, shown below, given out by Tangible Assets Gallery so people could see just what a PCGS certified coin would look like. Each sample came with a card that described PCGS and the War Nickel. 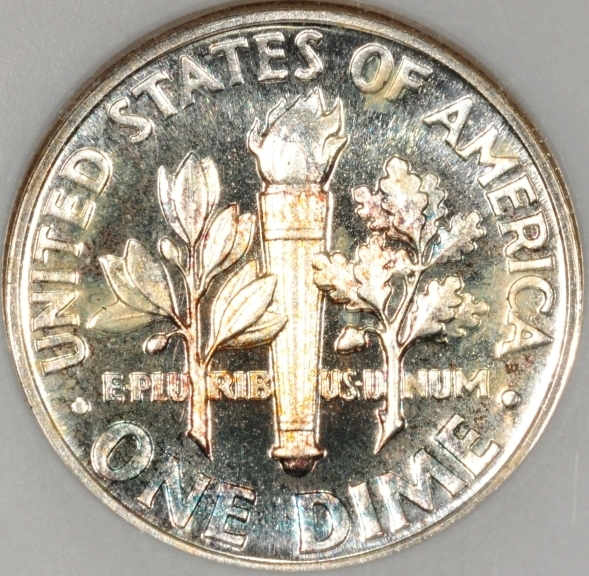 Now, we know this coin was produced from 1942 to 1945, but there is also the different mint marks to consider. This would bring a total of 11 coins when considering the P, D and S mint marks. That is, if all the mint marks were used. The 1942 coin only had two mint marks the P and S, 1943 to 1945 had three D, P, and S. This is quite a challenging set to complete. Do I know for sure that all the coins were slabbed using all the mint marks? 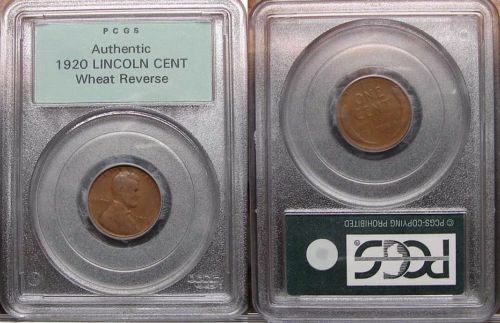 The answer to that is“No!” The only mint marks I have found so far are P and S. The only sample slabs I know of that were produced with both of those mint marks are the 1943 P, S and the 1945 P, S. As for the others, I just can’t say which of the other mint marks were used. 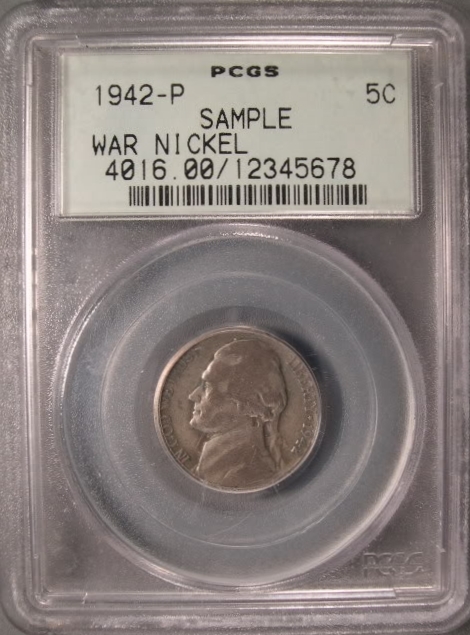 The War nickel’s used in these samples, even though 35% silver, were in most cases of very low quality, this could be the reason they are hard to find today. The coin might not have been considered anything very special, so I think many were just discarded or lost over time. Today, one of these samples can bring $50.00 and a perfect case for: “buy the slab not the coin.” The coins inside these samples can be identified by the large P, D or S above the top of Monticello on the reverse side. 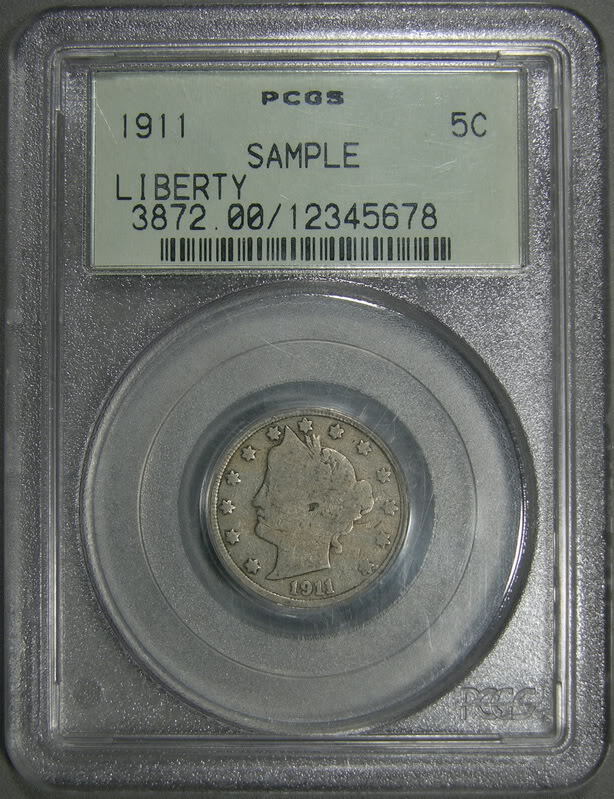 Another set of circulated coins in a sample slab is the PCGS Liberty Head nickel, again with a very low grade coin inside. 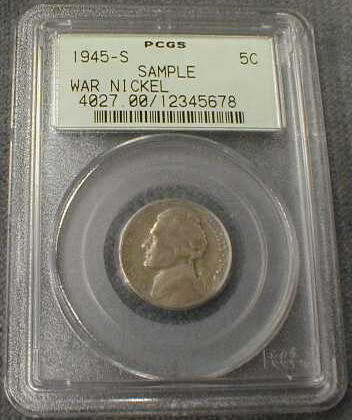 This sample also had several different dates, but unlike the War nickel the amount of dates used in these samples is, I think, unknown. I have found some dates – the oldest one being an 1898 and the last being 1911. Here are the dates I have found so far, 1898, 1908 (not shown), 1901, 1906, 1907 and 1911. There could be more dates just waiting to be found, as I have said in other articles, sample slabs do have a certain mystery to them. 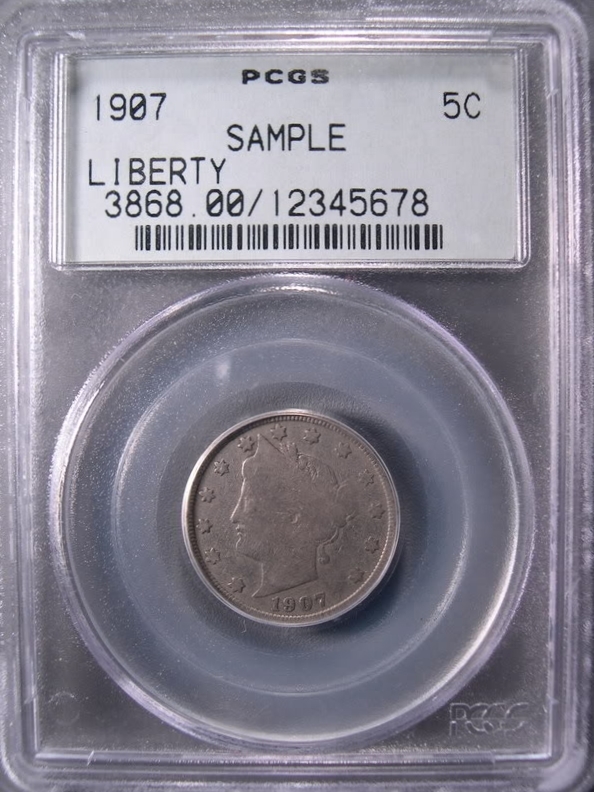 The sample with Liberty V nickels are hard to find, they rarely come up for sale, and when they do they can sell for a very high price. The last one I saw for sale was a 1907 and it sold for $304.00 on March, 25 2012, Serial number 3868.00/12345678. Now, it is also unknown if this was handed out to the public or was it a dealer-only sample slab. 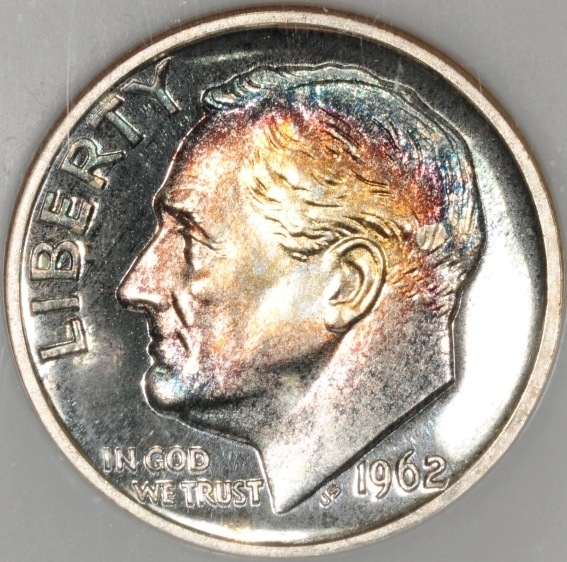 Because of the low value coin inside the sample, they were probably not considered anything special and, therefore, again lost or discarded over time. 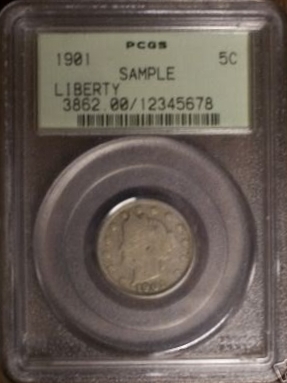 As I was writing this article a 1908 Liberty V nickel came up for auction and sold for $237.50. 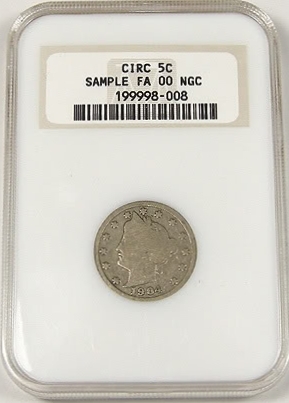 NGC also used a Liberty Head nickel sample, but they used the word “Circ.” I don’t know how many dates were used as this is a very hard sample to find. I believe the sample below is 1904? I have also seen a 1903. Another interesting fact about this sample, it is the first NGC sample to use a bar code on the front. I have only seen the two samples and the 1903 sold for $83.83, so I now have an idea of how much one would sell for. I am sure if another one comes up at auction, it will fetch a high price as well. I have written about this next sample in an older article, but it does have a place in this one as well. Originally produced as part of a Random House coin collecting starter kit as I said in my other article. 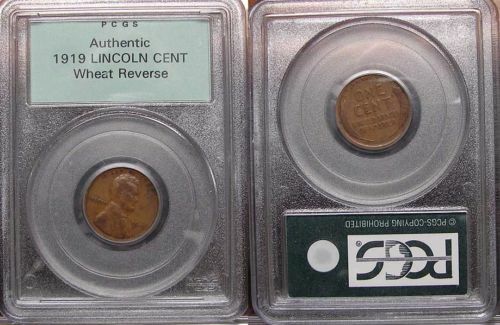 I would have to assume these slabs were an example of what a slabbed coin would look like. Therefore, it would be considered a “Sample.” It also holds the pedigree of being the largest amount of samples ever produced with an estimated 50,000 to 100,000 slabs. The dates on this sample runs from 1917 to 1929, as far as I know there was never a 1921 or a 1922 produced. The slab has no hologram on the back and can be a fun and inexpensive set to build. Some dates can be harder to find than others, but they are showing up more often these days. You can still buy one for under ten dollars, some sellers also sell them in a groups of three or five and so on. 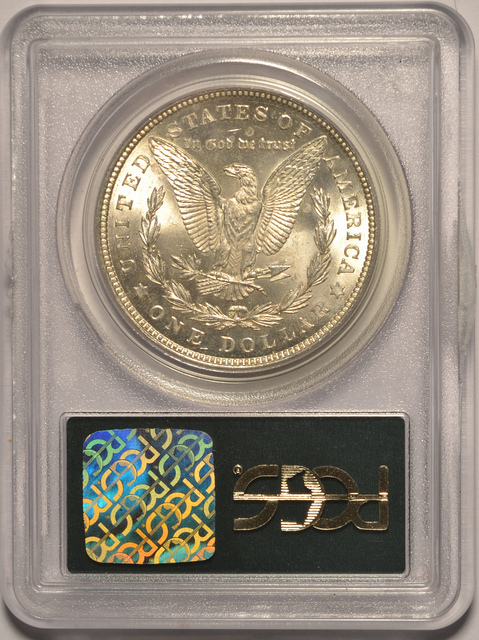 Probably one of the best known sample slabs: the PCGS 1921 circulated Morgan silver dollar. Over the past year this sample has not been that hard to find. This could also change at any time with the amount of bidders I see when one comes up for auction. 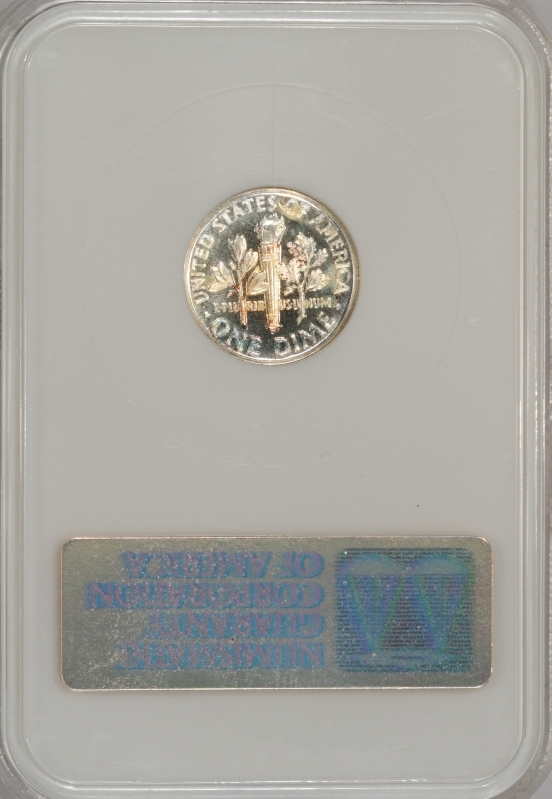 This is a dealer slab and unlike other circulated samples, this coin would have been saved, because of the Morgan silver dollar inside. One more thing to take note of is the fact that another Morgan circulated sample was produced, unlike the green label sample below, this sample had a very blue coloured label. When doing research on samples, I always try to use a picture of the sample, this is not always possible as with the last two samples. This is what I have come up with so far with these two samples. 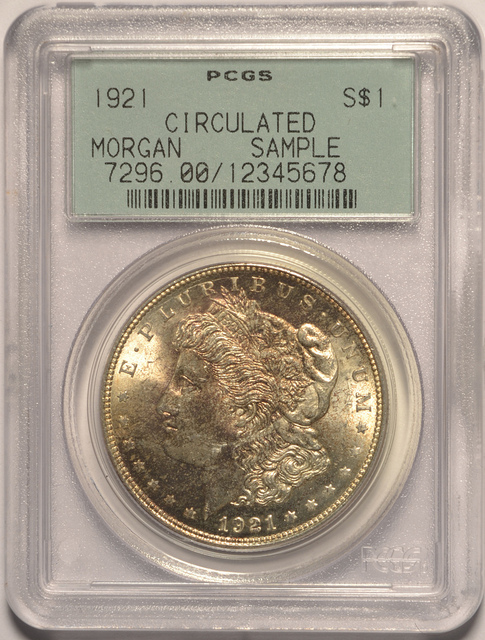 The next sample was a real surprise, as far as I knew the only silver dollar sample that PCGS produced was the Morgan. 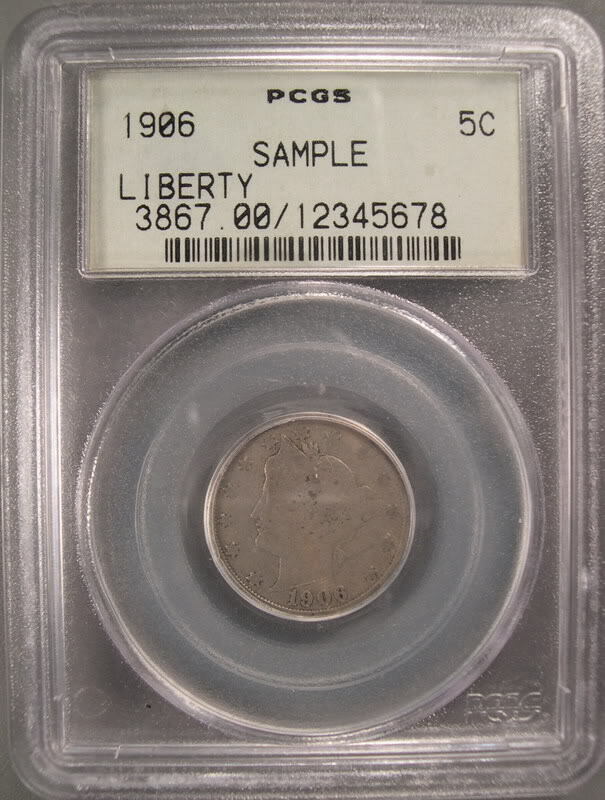 Until I came across something I had never heard of, or seen before: a circulated 1923-S Peace silver dollar in a PCGS sample slab. This really took me by surprise! With the standard serial # 654321 .00/12345678. I think it took a lot of people by surprise, when it sold for $390.00, the amount of this sample slab produced must have been very small or I am sure it would have shown up long before now. There is another circulated sample that is a real mystery to me, I have only seen a picture of one, it is a PCGS circulated no date buffalo nickel, serial #3914.00/12345678. I have never seen one for sale and trying to research it, I seem to be getting nowhere. But at least we know the serial number and the coin inside the samples. Researching samples can, at the best of times be a difficult task, getting pictures can be even harder. 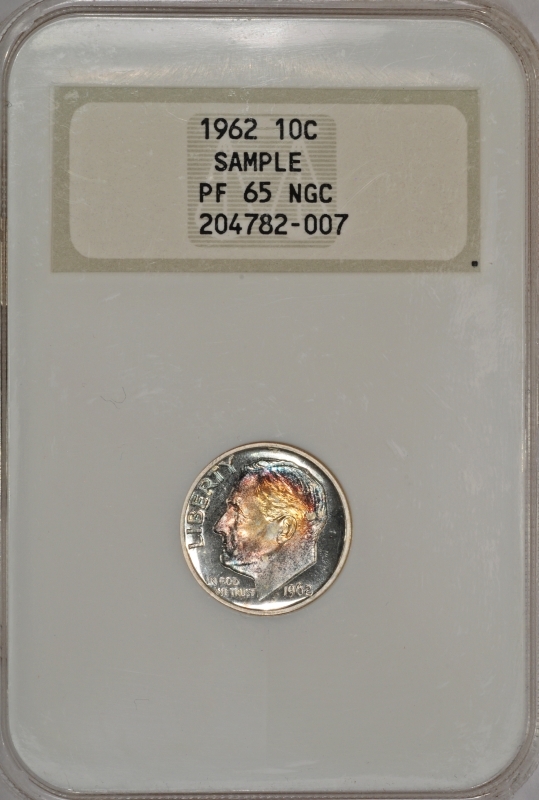 Sample slabs can also have some amazing toning, this NGC PF 65 is a great example of that. 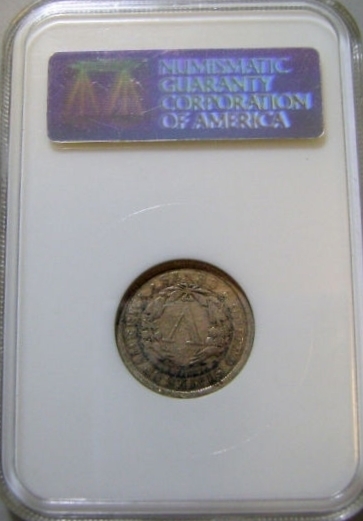 This entry was posted in Sample Slab Guides and tagged Circulated, coin, Sample on September 12, 2012 by Daniel.